Going in for the finished version of Circuits Fermés at Auch’s Festival Circa I’d seen it twice before as a twenty-minute presentation, and was stuck with this idea that it was like an opus of juggling études. 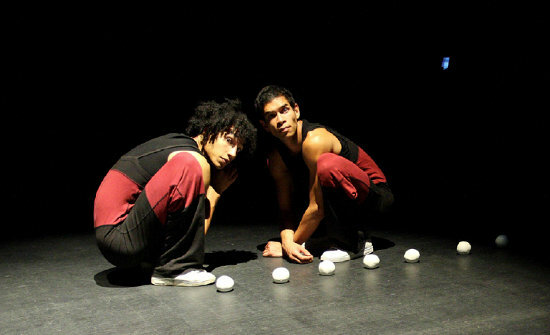 In those early showings the two performers, Guillaume Martinet and Minh Tam Kaplan, had characters of a kind, these sneezing, leaping, fraternal monkey-ish creatures who were closely fascinated with the soft, white juggling balls that surrounded them — their arrangement, their texture, their taste — but the juggling itself had the high technical beauty of classical music (one scene was set in fact to a Chopin étude), the scenes/studies divided by quick blackouts and the sound of adhesive tape being ripped. How would they adapt it for a longer format? Would they create more short études? Lengthen the pieces they’d already made? Tear it all down and start again? Having already seen three or four overlong, overstretched shows at Circa, I was cynically prepared for the possibility that the lightness and cuteness of the original creation would be overplayed, and was, therefore, delighted to see the company, after replicating the twenty-minute version almost exactly for the first half of the show, make the decision to blind and then kill one of the characters (sorry, spoiler), plunging the piece into something resembling a Cain and Abel parable played out by obsessive compulsive juggling monkeys and thoroughly destroying its prospects as a work for early years audiences. So it’s a swerve. At a certain point Minh Tam just breaks, snapping into a catatonic state, rolling balls down the short curve of his chest, collarbone to diaphragm, over and over, staring straight ahead. Guillaume doesn’t know what to do. The crisp, warm, fast sounds — like microsecond samples of bottles and pans being played — that earlier made-up David Maillard’s soundtrack are switched out for a low, rumbling chant that circumscribes their actions with a dangerous ceremonial significance and suffuses everything with a close, expectant dread. Obviously part of my enjoyment was predicated on the fact that I was familiar with the material and ready for something new, but I think it’s also a brave decision, and one that signals a willingness to test the borders and the capacities of their characters by throwing them out of their routine lives and into danger; in other words, to break the circuit and follow the consequences through. In a way we’re prepared for this, with those sharp cutaways between scenes — the sound of the ripped tape — but what I think I liked about Circuits Fermés was the suddenness with which its separate elements leapt into the shape of a story. The rug is pulled out from under your feet, and you realise it has left you so little, as you frantically search through your mental notes, in terms of evidence with which to reconstruct what might have happened. Really there’s nothing — a presentiment of fragility, a flowing golden light, and this lingering sense that perhaps the clues were coded there in the juggling, faster and more intricate than you could follow.